The world is big because it has contained so many species in it. The world becomes smaller and smaller because we can reach anywhere on earth in one day by airplane. And have you ever imagined that one day you can take the whole world in your hand? Now it is available to you only by this Skype phone. It is said that Skype phone is like but better mobile phone and headset. As it works after plugging to USB interface, it is also called USB phone. Different from Internet communications, it comes to be more stable with some functions of mobile phone included while the traditional telecommunication network is still available. Different from traditional network, it can also achieve many Internet chat messengers even without computer. 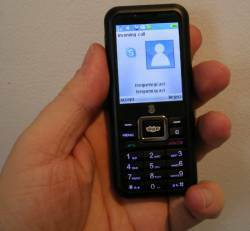 Skype phone, and then, has installed nearly all the languages in the world for contact list on LCD display. Therefore, you don't even have to worry about if any words and names are not available there. People from every corner of the world can be added. Meanwhile, when you are on a business trip in a foreign country, you can also help yourself to install any software and learn about the native culture, which has really made fully use of Internet. At moment, you can get several types of Skype phones in USB Phone World, including desktop phone, USB cheap phone, USB cordless phone and USB phone adapter. Just like Skype phone calls, no matter where you are, it can get to you in a short period. Accordingly, it is reality for us to make/receive Skype calls without consideration of signal. Just as when Internet born, the appearance of Skype phone is just an innovation to reach the global communication more convenient or even free.